The Paper Bead Boutique | Sharing My Love of Paper Beading! Hope your Spring season is off to a great start! Mine has been busy and is about to get even busier! I’m changing jobs in a week and will have even less time to devote to The Paper Bead Boutique, at least until I get use to my new schedule! But in the meantime, I’ve been busy, busy, busy trying to stock my Etsy shop back up with new and fresh things for you! I have quite a few new paper bead kits in stock! So much color and variety to choose from! All include my paper bead tool! I’ve taken on a new size focal bead, a full inch in size and a much lower price of only $5 for the set of 3, instead of $6.50! Continuing to replenish my stock of tube beads as they have been really doing well this year! In case you’ve not seen them, I now carry a 1/2 tube bead as well! I call them my shorty tubes! Super cute! So stop by when you have some time http://ThePaperBeadBoutique.etsy.com and check out all the new things I have to offer! And for the 1st time ever, I am offering FREE DOMESTIC SHIPPING on your order of $40 or more, now thru April 20th, 2019! Hope to see you Soon! Until next time, Happy Beading! We’ll I’ve done it! I made my 1st YouTube video! It’s far from perfect but I figured it out on my own with very little help from my tech savvy daughter! Now that I know what to do (to a point!) I will be learning more about making the video’s better and more complete so PLEASE, be patient with me! Follow my channel and look forward to more! Some of you may remember that each year, I like to make a donation batch of beads and create beautiful handmade bracelets with them! I donate them to one of our local breast cancer centers for those that are going thru treatments, are a survivor or know of one, or just want a little inspiration to take good care of themselves! I put each bracelet in a pink organza bag with one of my business cards tied to it and display the bracelets in a little basket so they are easily noticeable and don’t take up a lot of counter space! A conversation I had recently on Facebook really got me in the mood to begin my donation bead batch! So here’s what I have so far! Today is sealing day for these beauties! I have several more styles of paper I still need to cut, roll and seal before I can begin creating! It’s such a worth while project for me, so gratifying and something that’s dear to my heart! is such a great idea and a way to pay it forward to those that need a pick me up! Consider it…It will make your heart feel good! So it’s off to the sealing room! I will post again when all the beads are complete and we’re ready to begin creating beautiful pink jewelry! Comments Off on Donation Beads Underway! We’re having a SALE! It’s time to clear out some of our existing designs and get ready for some new designs and new changes taking place at ThePaperBeadBoutique.etsy.com! Now thru Saturday, March 9th, spend a minimum of $25 and save 25% off of our entire shop! It’s that simple! No coupon codes needed! Discount will be taken off when checking out! It’s a great time to stock up on holiday designs or everyday designs going into Spring! Just a couple more things to consider…This offer is limited to stock on hand, as well as one discount per customer, per visit! So grab a drink and sit back and shop where there is endless free parking and NO long lines at http://ThePaperBeadBoutique.etsy.com! Wanted to let everyone know we will be participating in Etsy’s Black Friday Sale! Our sale begins on Monday, November 19th and will run thru November 25th! Save 25% off your total order when you spend $25 or more! It’s a great time of the year to stock up and save at the same time! Stop by and pick out a few things you can’t live without! Our sale is limited to stock on hand so everything is available to ship right away! Join the Black Friday Frenzy but do it from the comfort of your own home, your own couch, in your jammies! It’s been quite a long time since I’ve posted…I’ve been without a computer…UGGHHHHH! I’ve been using my daughter’s but it’s not as user friendly for me as I am not very computer savvy! So I have a new laptop now and am trying to get myself back on track! Are you ready for the holidays? Are you planning your 4th quarter projects? I am and am already super busy in my mind, just thinking about all I want to do to prepare for the 4th quarter! I have my first show in years happening this Saturday, November 3rd from 9am-4pm at Sunrise Elementary School in Kent, Washington! Those in my area, I’d LOVE to see you! I will have most all of my paper bead jewelry displayed for your viewing pleasure! It should be super fun! I am currently offering FREE SHIPPING on orders over $40 so stop by the shop and see what you can’t live without! I will have an upcoming BLACK FRIDAY Sale that I am super excited about! Details to follow! 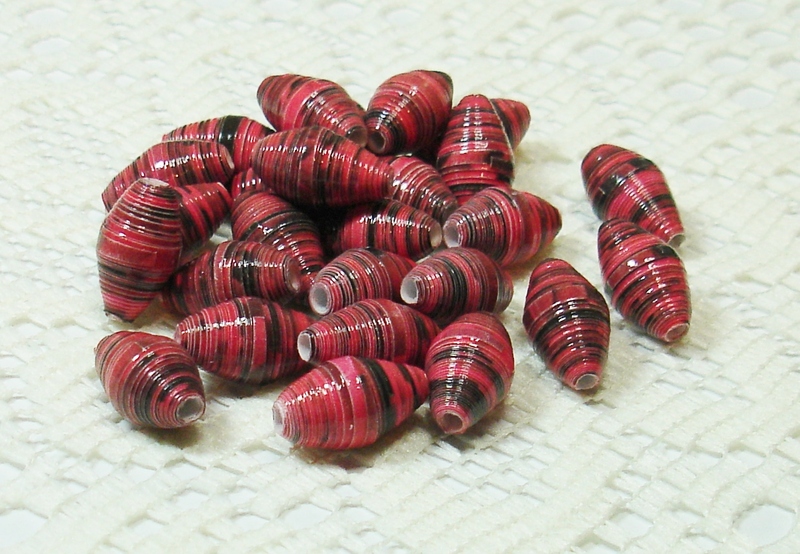 Now that I am back to work full time, I don’t have nearly the time to bead as I’d like…I am trying to get new designs posted as often as I can but don’t like to rush so I can continue to bring you the best quality paper beads possible! Continue to check back and see what’s new! My goal is to post new designs each week for you! Etsy Birthday Sale Going On Now! We are offering a 25% discount on your purchase of $20 or more, when you use code BDAY25 at checkout, NOW thru Friday, June 22nd! Stock up on your supplies for all of those fall and holiday projects! Do a little Christmas shopping for other crafter’s in your circle! Take advantage of one of our biggest sales of the year! Don’t wait to long…Most paper bead designs have only one quantity available!